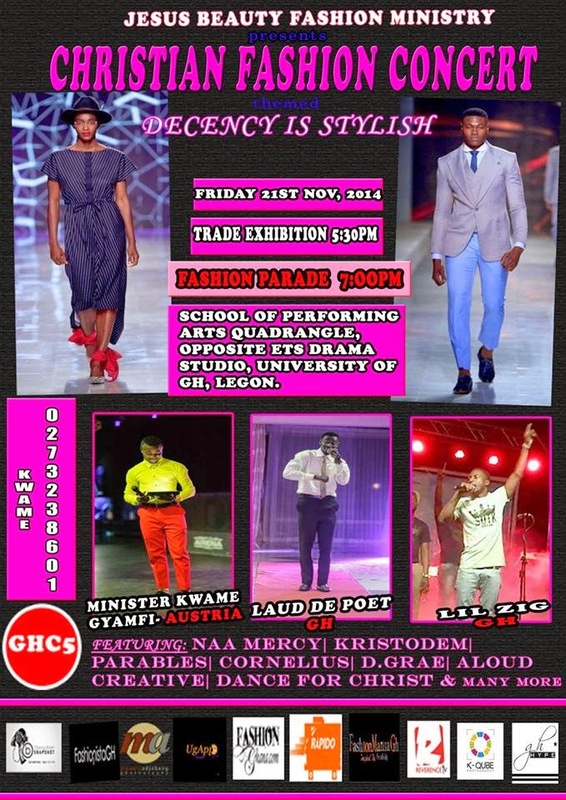 The event is scheduled to take place on 21st November, 2014 under the theme; “Decency is Stylish”. The service commences with a trade exhibition which shall witness entrepreneurs in arts (such as pencil and paint arts), fashion designing, beads and accessories, slippers, shoes, belt, hair styling, make-up artistry, photography among other fashion related ventures exhibiting their products and talents to the general public and climaxed by a runway fashion concert, both at the Quadrangle of the Association of School of Performing Arts(ASPA) opposite the Efua Sutherland Drama studio on University of Ghana, Legon, main campus. The Objectives Of The Show Goes As Follows…. To influence the fashion trend to more decent ones for Christ. To inspire young people to come out with their potentials and abilities. To inspire many other physically challenged people to be models (examples). To educate people on how to dress decently. To create a networking opportunity for people in the fashion industry.